Recently my mom had the best idea she’s ever had. That I should try every single flavor of Ben and Jerry’s ice cream and review them all on my blog. TWIST MY ARM! According to my research, there are 46 original ice cream flavors out there. I plan to find them all! That’s probably going to end up being about $200 in ice cream and 92,000 calories of straight fat. But that’s just the type of thing I’m willing to do for the readers of Divasayswhat.com. The first flavor I didn’t even have to re-try. That’s Half Baked and I’ve had it about 100 times. You know, usually in life I do not like it when things thwart my path. 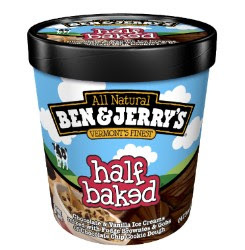 However, with Half Baked that is not so. And that’s because those “things” are going to be either chunks of brownie or balls of cookie dough. And honey, they can thwart my path anytime they like. Final verdict: I love this ice cream and I love the rich toppings mixed in. The ice cream flavors in this particular ice cream don’t stand out as much as some other flavors, but that’s ok because they are just the supporting characters in a pint-sized show in which Brownies and Cookie Dough are the real stars. Half Baked is a show I could watch again and again and again!